The Railyard District in Santa Fe, New Mexico is a historically rich and diverse mixed-use center for Santa Feans. The majority of construction was completed between 2005 and 2012. Due to market forces, a significant section of the Central Plaza was not able to be designed or built until the anchor, Violet Crown Cinema, could be realized. 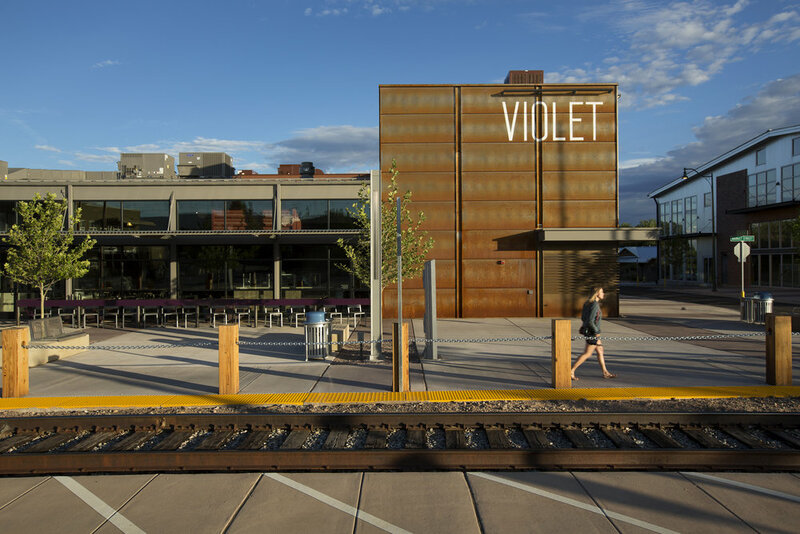 Surroundings was hired to collaborate with Domiteaux + Baggett Architects and Bohannan Huston Engineering to plan, design, and oversee the construction of the streetscape and remaining Plaza spaces that stitch the Violet Crown Cinema to the Railyard District's central core. Being at the heart of the Railyard District, the Plaza provides space for outdoor events, community gatherings, and every day uses for vendors. The area had to be a flexible and resilient space. During this project, Surroundings was asked to re-envision the existing wooden benches that are a hallmark of the Railyard Park, due to the deteriorating wood benches not suitable for the arid southwest. Keeping to the original concept, Surroundings was able to capture the essence of the slab bench, but in concrete which will last for decades.